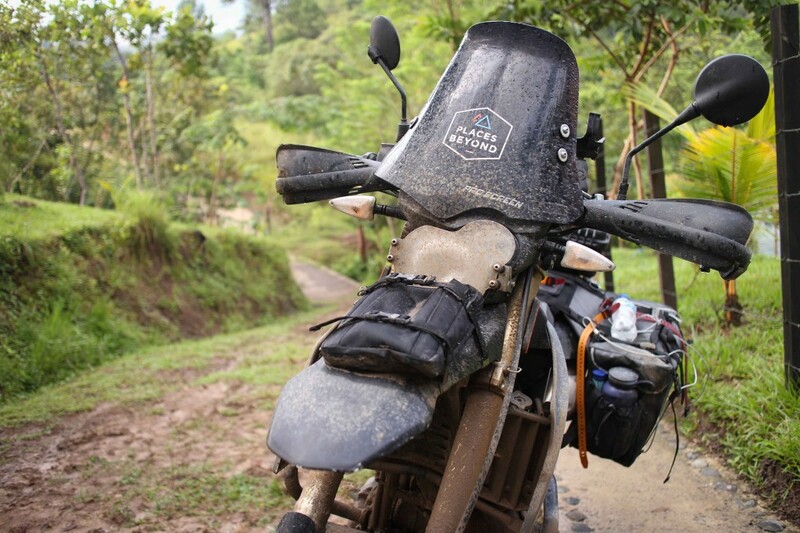 “The word adventure has gotten overused. 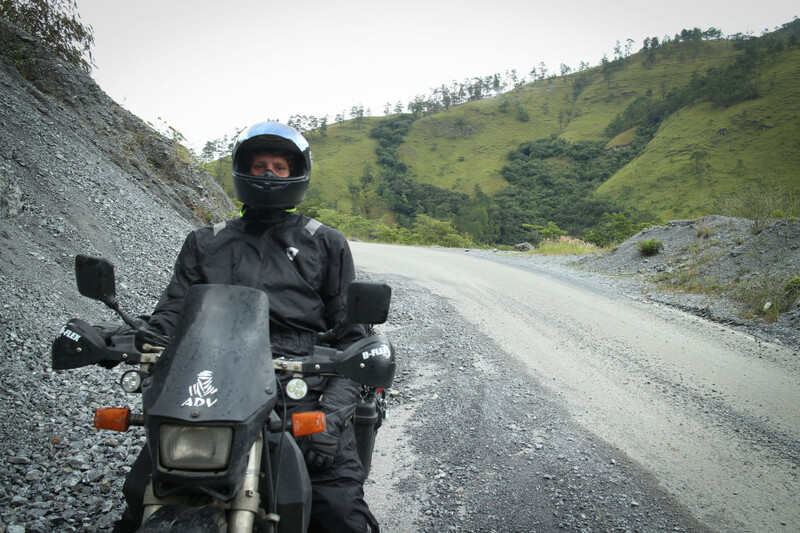 For me, when everything goes wrong – that’s when adventure starts” That’s a quote from the documentary 180 Degrees South.  Yvon Chouinard, founder of Patagonia, says it and when I first watched the film that line stuck in my head. Thinking about this trip I feel like I’ve already been on an adventure. But in Yvon Chouinards definition maybe my adventure began yesterday morning when we left San Pedro. 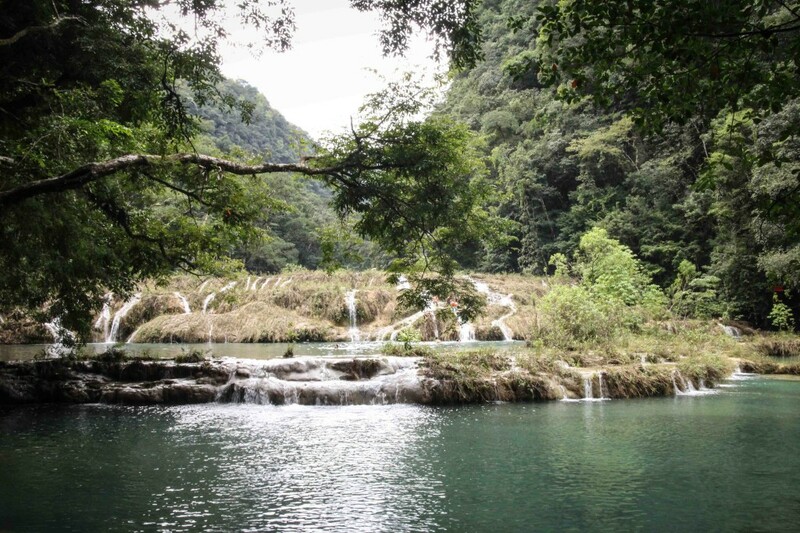 I decided to ride with Kyle and Trevor to Semuc Champey after hearing so many people talk about it. Looking at the map and from talking to Javier we knew there would be a section on the route where the road was destroyed and would be a rough ride. After a week of the bikes sitting we checked tire pressure and prepped the bikes. 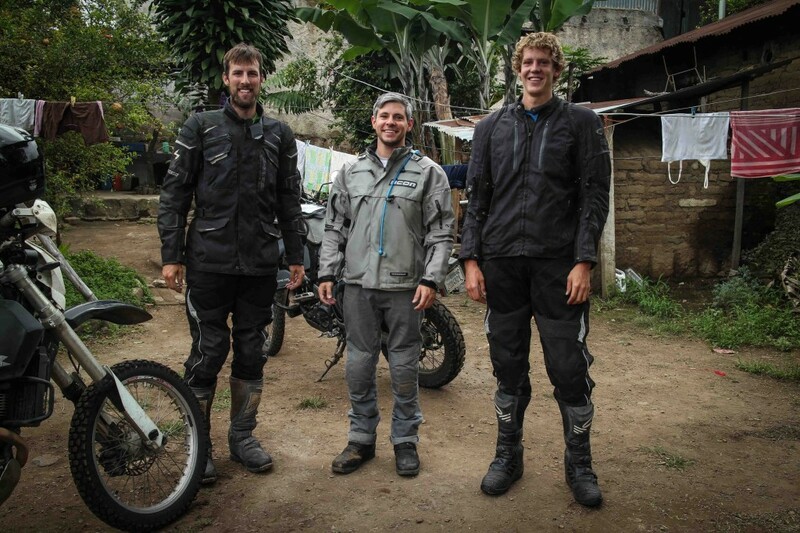 I felt tall in Guatemala until I met Kyle and Trevor. The three of us set off from San Pedro and made the climb up the mountain. Up one side, down the other. Over and over we rode through small towns. Many of the tumulos weren’t marked so you had to always be alert. Weekends are market days so all the towns we drove through had all the vendors out. The only food we saw for sale were tortillas and fried chicken. So much fried chicken. For $.40 per chicken piece it was a good deal. With the three of us riding into towns everyone stares. I think that’s mostly cause Trevor and Kyle have the loudest exhausts and then when they get off their bikes they are almost 2 feet taller than anyone in the town.  Grande gringos! The next section was going to be where the road gets bad. It started raining which would make this even more of an adventure. When they said the road was destroyed they weren’t kidding. The mountain completely wiped it out and the locals rebuilt what they could to get by. 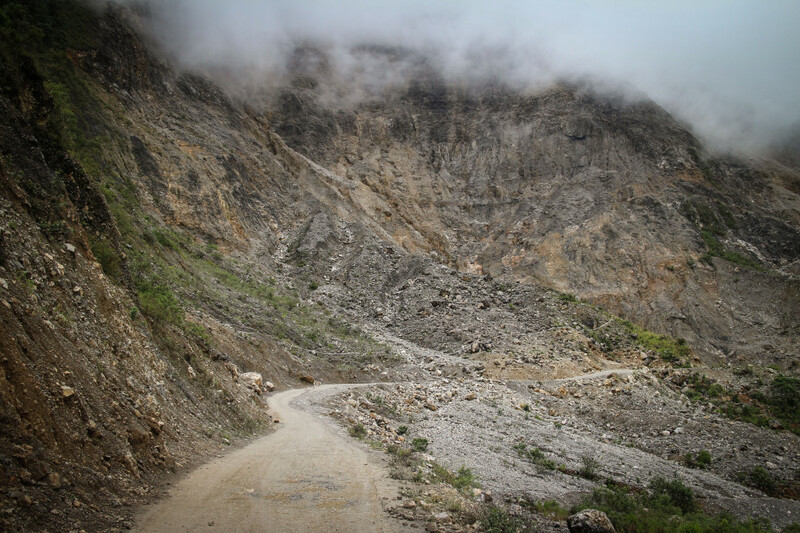 Parts are still paved with massive pot holes and parts where the mountain slid into the road and people made paths on top to get over. This is highway 7W. About 40km of the road west of San Cristobal Verapaz is destroyed. We passed small pickups loaded with people in the back. That has to be an awful ride. 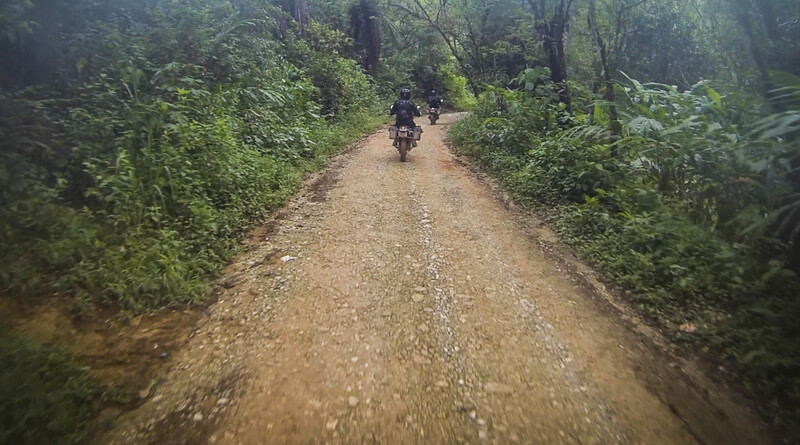 By time we reached the pavement our bikes and us were covered in mud. 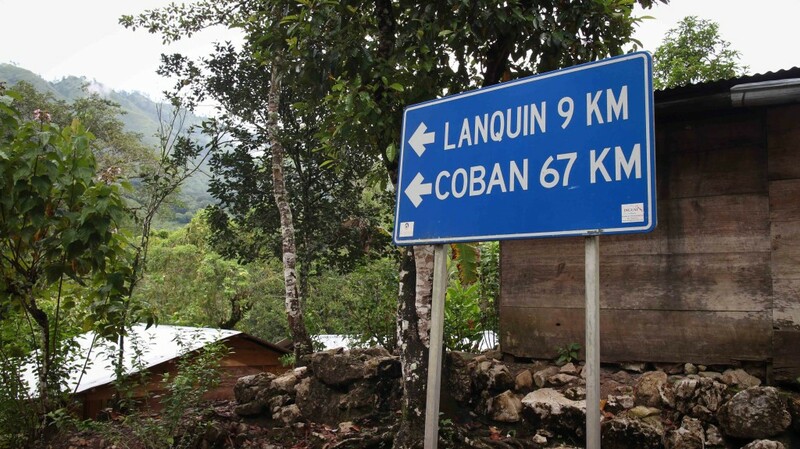 We reached the town of Coban and were feeling good, but tired. With less than 60km to go we’d be at a hostel in under an hour. 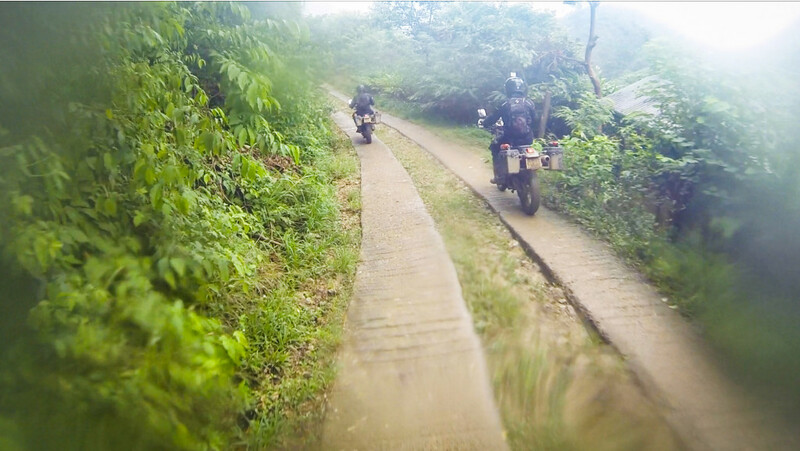 The road was nice until the rain came and soaked it making our ride around the curves kinda slow. We rode a few more miles and to our surprise the pavement ended. There was a rocky dirt road to the left and a rocky dirt road to the right that went down the mountain. How did we miss this on the map? A policeman said Lanquin and Semuc were to the right. I thought maybe it might just be a small section of the road that would be like this. 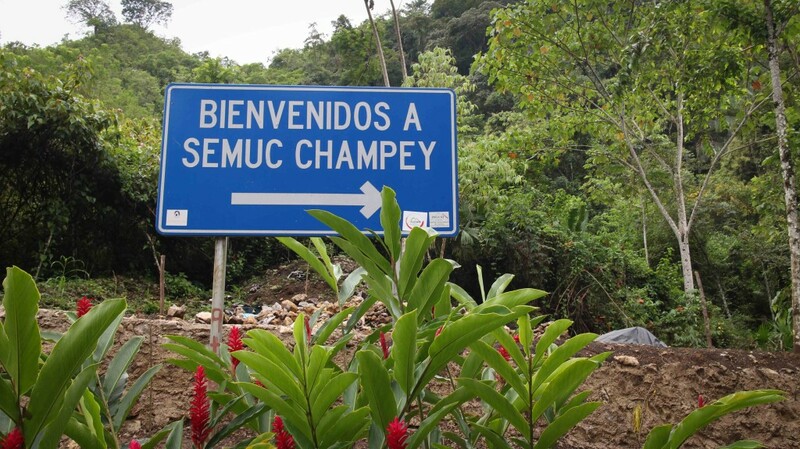 Afterall, Semu Champey is a popular tourist spot and busses take people there. It must get better. I was wrong. 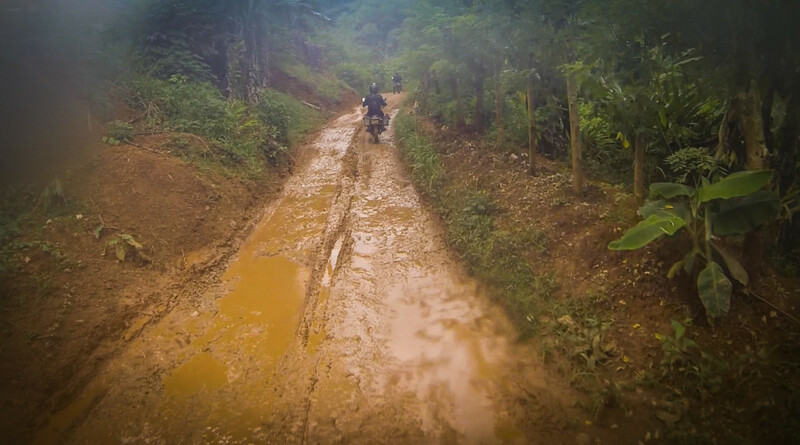 The whole 15km road to Lanquin was a rocky muddy mess. 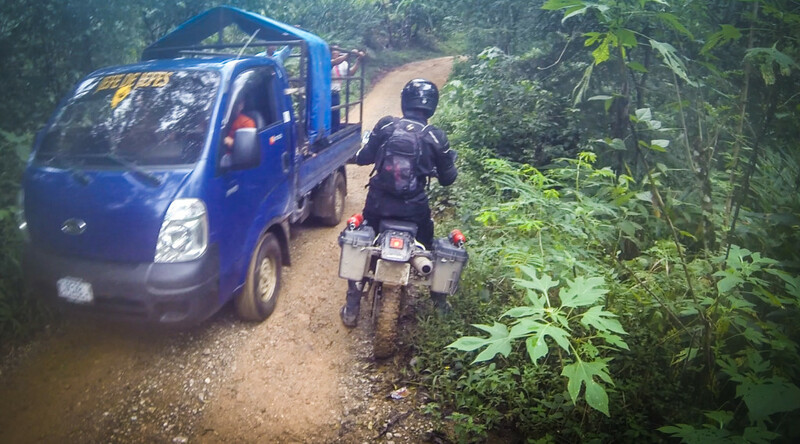 Some sections were so narrow that to avoid being run over by busses and trucks we had to pull over into the bushes. It looks like no one here changes tires till they fall apart. How they make it up and down these slippery roads is a mystery. The road became incredibly slippery as my tires were caked in mud. 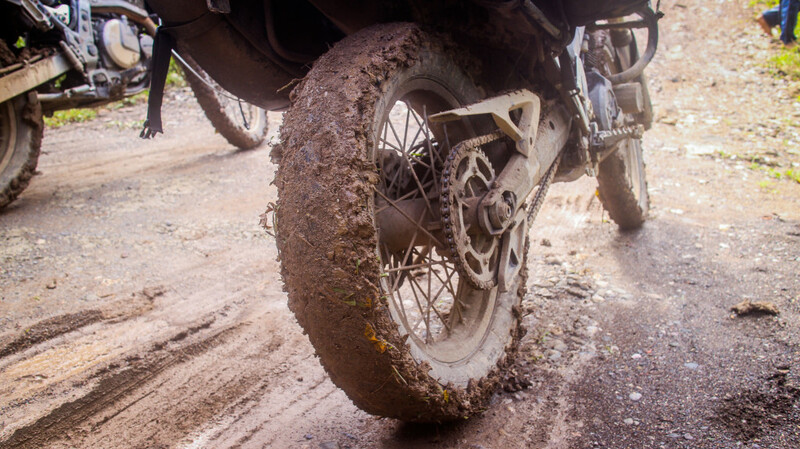 One moment I was going down hill standing on my pegs and the next I was in the mud as my bike slid and spun around facing the other direction. Kyle saw that I wasn’t behind him anymore and came back and helped me get the bike up and turned around. 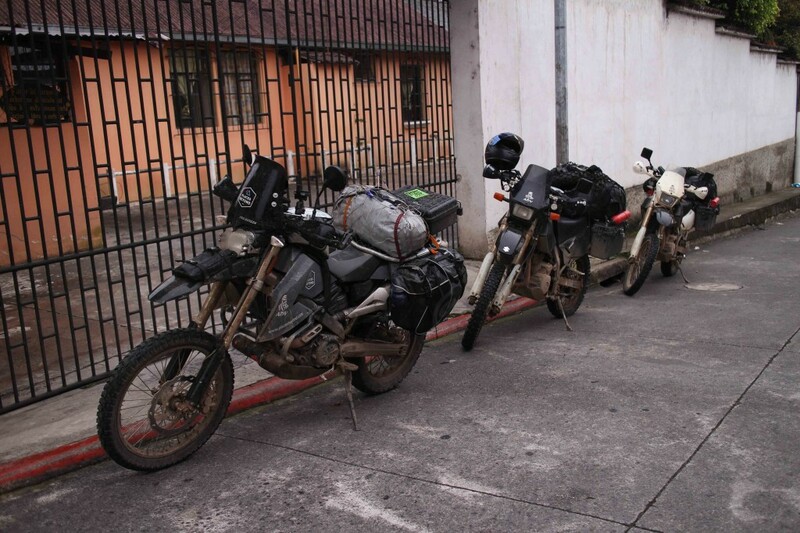 I was exhausted and slightly embarassed as the minibus of backpackers we had stopped and talked to a minute up the road drove by looking at my and my bike on the ground. I gave them a thumbs up. Nothing going on here, folks. Just laying in the mud. A few minutes later Kyle hit a slippery spot and slid out but managed to stay up. 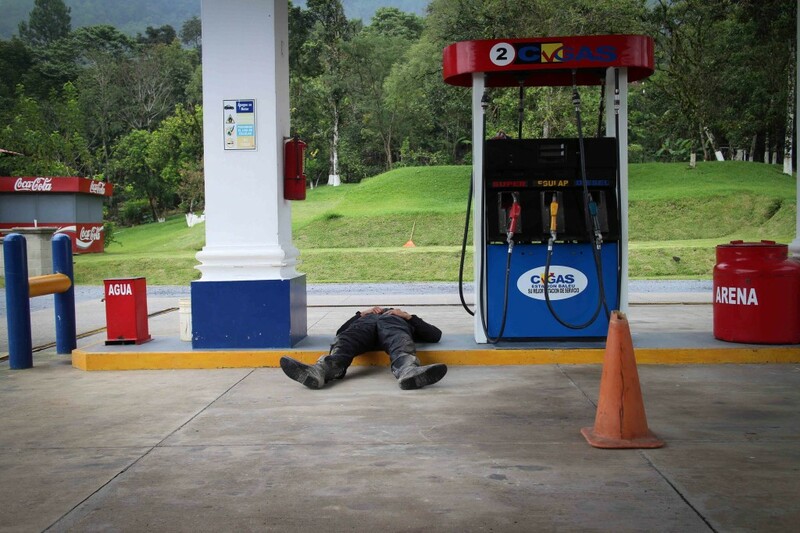 We had a few more kilometers to go when we came around a corner and found a man laying in the road and another man standing next to him holding his limp arm. Laying in the muddy roads must be a thing here. We stopped for a moment. I hadn’t thought about what I would do in this situation. 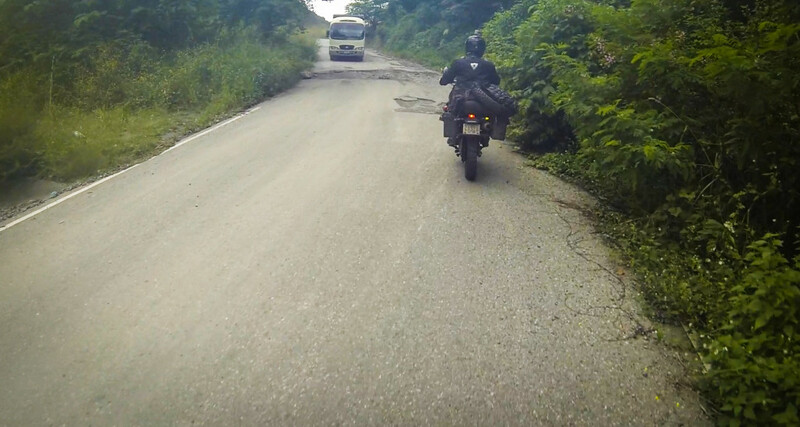 Knowing that motorcyclists get robbed on small roads like this in Guatemala I just wanted to go. We had just passed a two vans a minute earlier. They would have room to pick these guys up. I’m still thinking about that situation. I wanted to stay and help but in reality I couldn’t carry anyone on my motorcycle and I had that feeling that said just go. If anyone else traveling through there has had a similar experience let me know. After that encounter I was really ready to be at the hostel. Just as it was getting dark we rode into the small town of Languin. Semuc Champey was another 10km from here and there was no way any of us wanted to ride that at night and we had no more energy to do it. Now we needed to find a place to stay. Before we could even look around a guy came up and started telling us about a hostel and showing us a brochure. It was only a minute away and the price was right so off we went to Hostel Oasis. 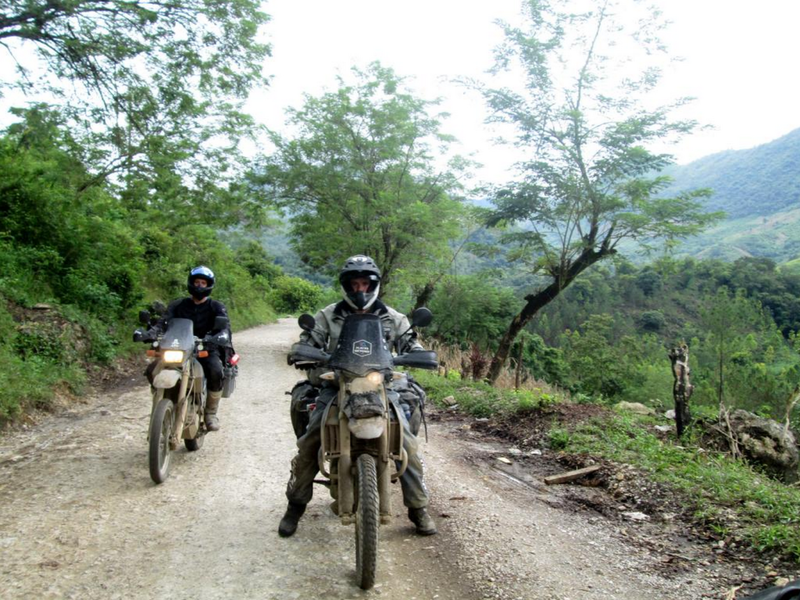 Down a two track dirt road we came up to the hostel. The parking lot was as the bottom of a hill and the hostel up top. Not wanting to carry all our gear we asked if we could ride up the path. I just followed Kyle and Trevor not knowing the guy said we could but that it was really muddy. So up we rode sliding all around in mud a few inches deep. 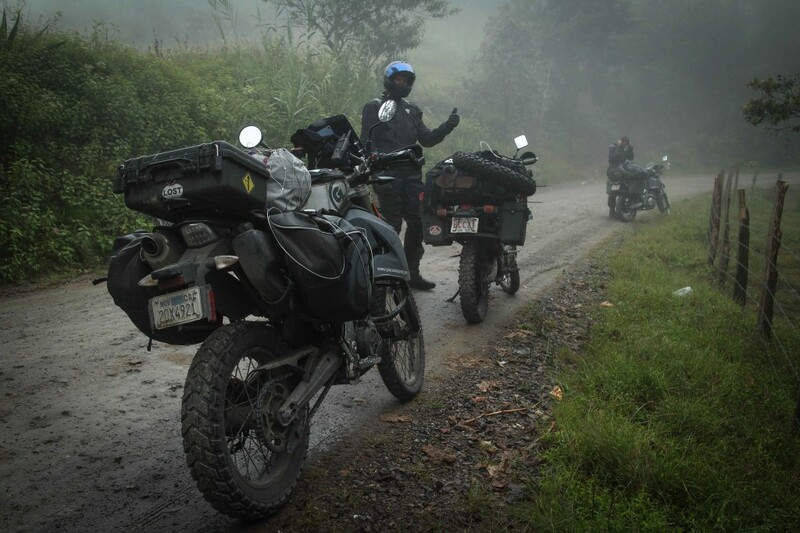 We managed to get our bikes parked on the hill and put bricks underneath our side stands so they wouldn’t sink in the mud. By the time we unpacked it was 7PM and we were starving and thirsty. We went through a pitcher or more of water. By 9:30 we were passed out. 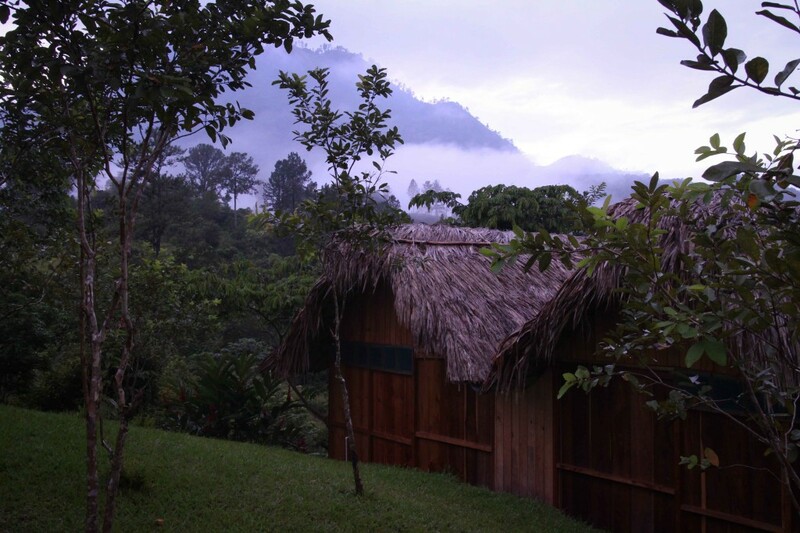 I heard the rain for most of the night coming down hard which would make the infamously bad road to Semuc Champey even worse in the morning. 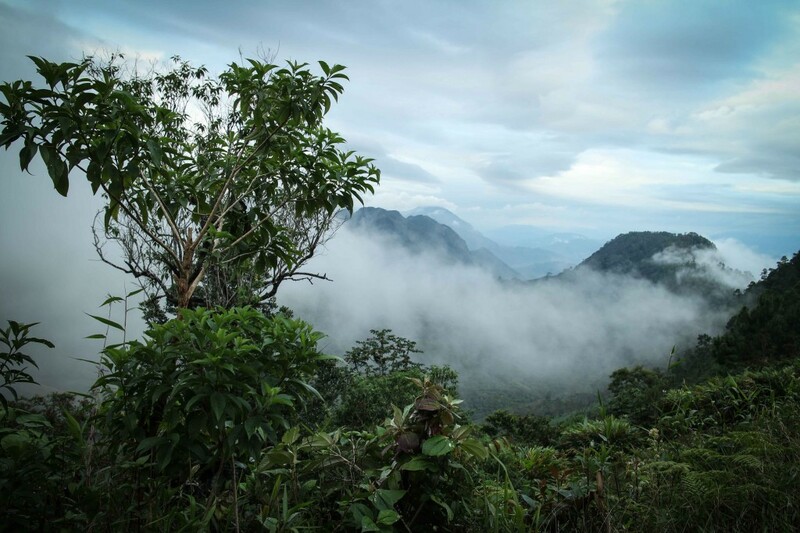 By morning the rain had stopped and there was a glimpse of blue sky behind the heavy fog covering the mountains. 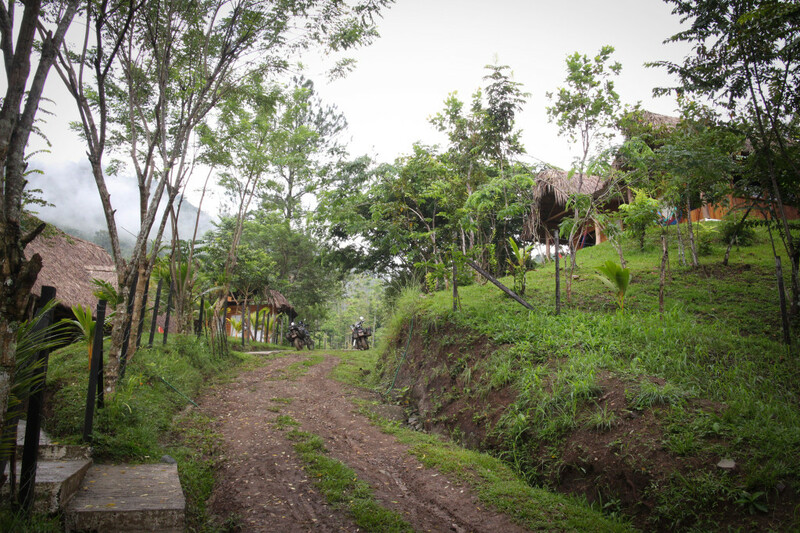 The bungalows at Hostel Oasis in Lanquin. It doens’t look that bad here but the night before this was a muddy mess. 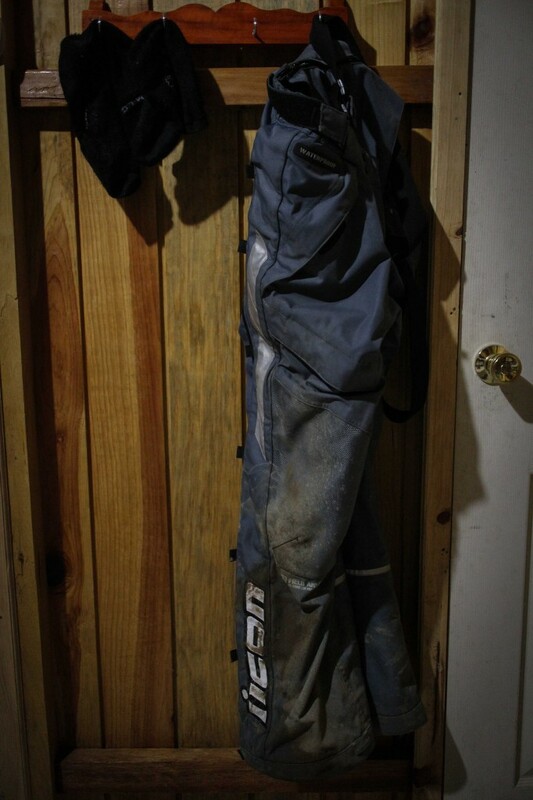 We left our gear at the hostel so we could ride unloaded on the sketchy trail. 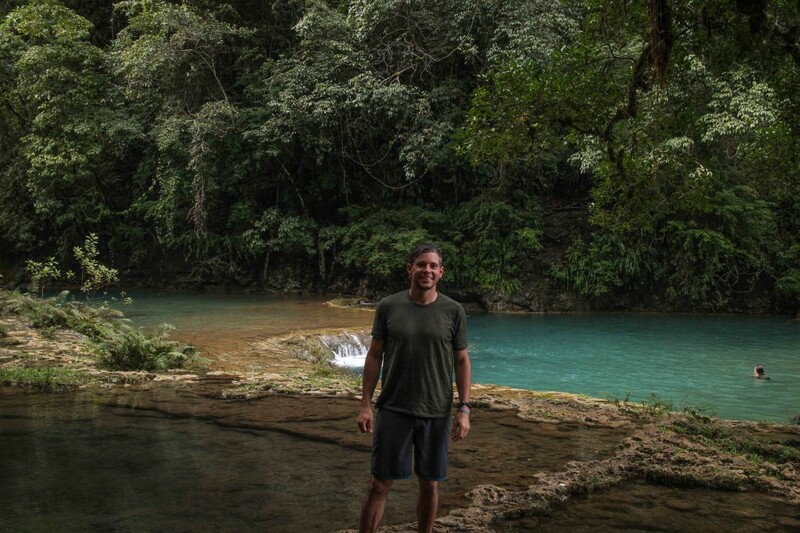 Semuc Champey is 9km passed Languin on a very narrow and steep trail. 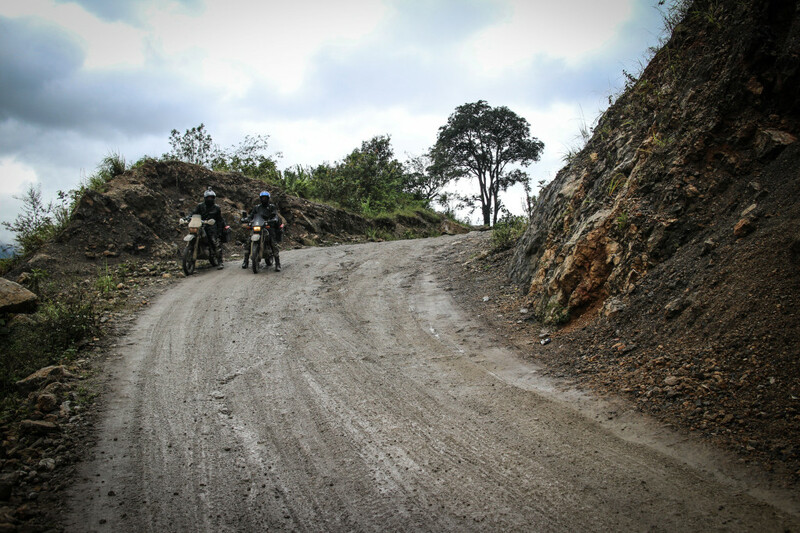 In some of the steepest sections there is cement 4×4 track. Though even that is beat and falling apart in places. As we climbed the sun came out which was nice but made for a hot ride. At one section on the road a rope was tied across the trail. 10Q per moto for the road volunteers. You have to pay them. The road didn’t seem to improve after that. Maybe they just keep it from getting any worse. For that I’m ok paying $1.25. We reached the park entrance and paid 50Q for entry and 10Q for parking. 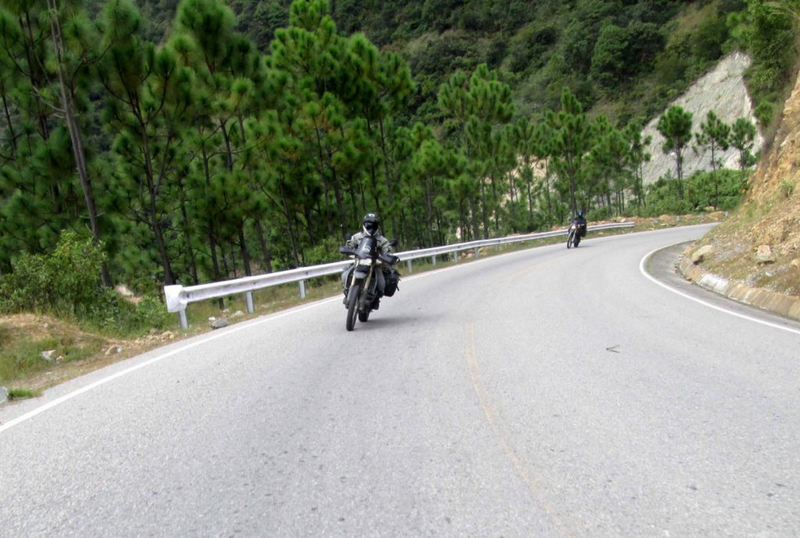 That’s probably the toughest stretch of riding I’d ever done. 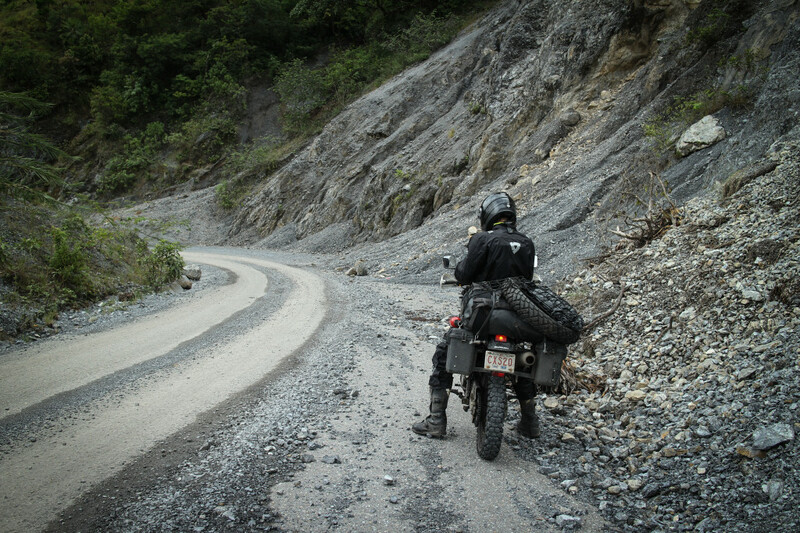 Steep, rocky, muddy. Making it to the top felt good. 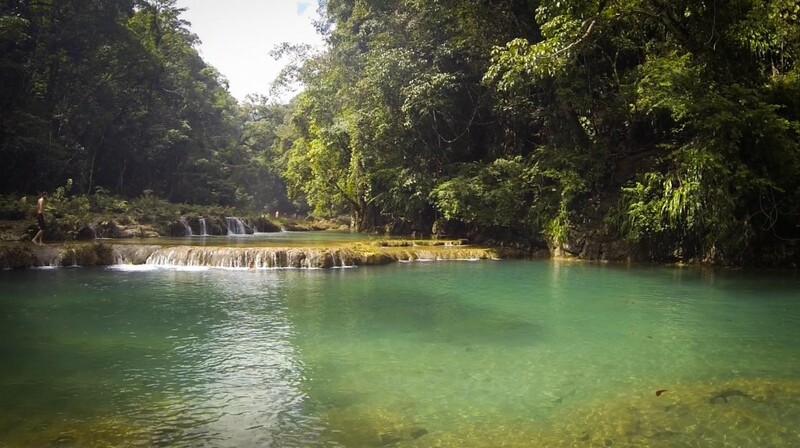 Semuc Champey is a unique natural area where the Cahabón River flows 300 meters under a limestone bridge underground. 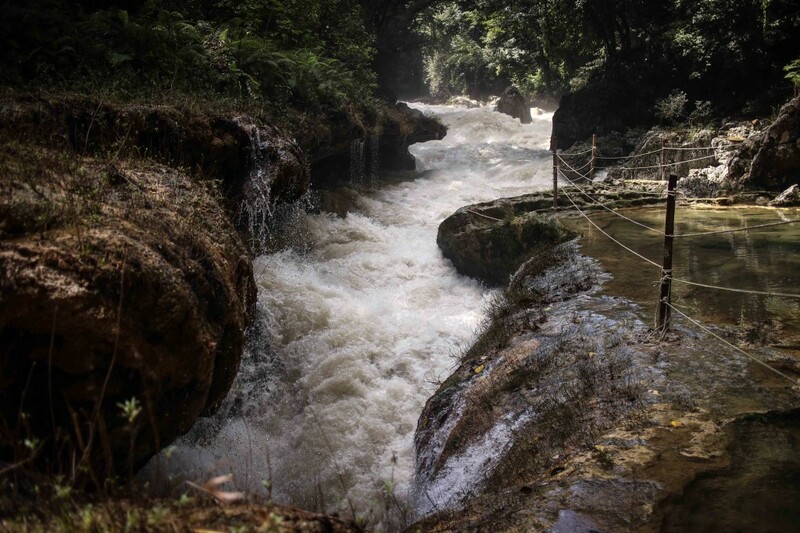 On top of the limestone bridge are pools of clear blue water slowly flowing down. Standing along side it or from above the view is amazing. Following the path for a few minutes we came to the pools. With sun out and the clear water inviting us in; we didn’t wait a minute to jump in from the rocks. The point where the river flows under the bridge. The power of the river here is incredible. When we had enough swimming we headed back to the park entrance where local women were selling BBQ chicken and pork. Their kids walk throughout the park selling homemade chocolates made by their moms. One little 8 year old girl was especially talkative and wanted to know all about us. How old were we? Where did we live? Following lunch we were ready to hit the road as we heard there might be rain coming and the last thing we wanted was to ride the Semuc road in the road. As we were putting on our gear the sun disappeared and it started to lightly rain. Well this should be fun. 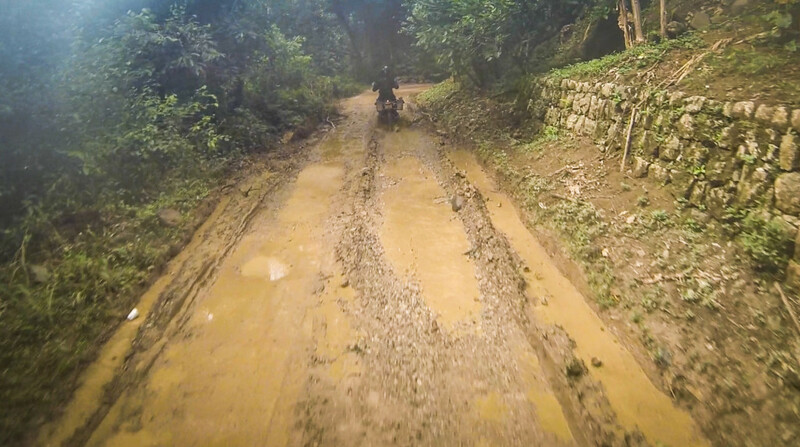 We rode down and the rain picked up turning the dirt into mud and the rocks extra slippery. 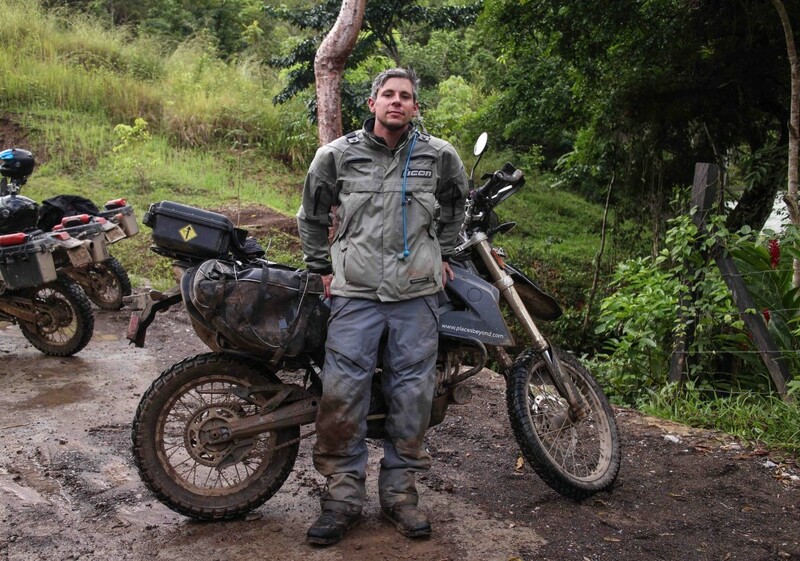 Things were going fine till I hit a smooth spot with a nice layer of slippery mud and I was down. Kinda like a slip n’ slide except for its in mud and I was on a 300 lb motorcycle. I thought I had the GoPro recording but I started recording when I thought I was turning it off. Oh well. Coming back I think we did the 10km in 45 minutes. We got back to the hostel and had a celebratory beer. 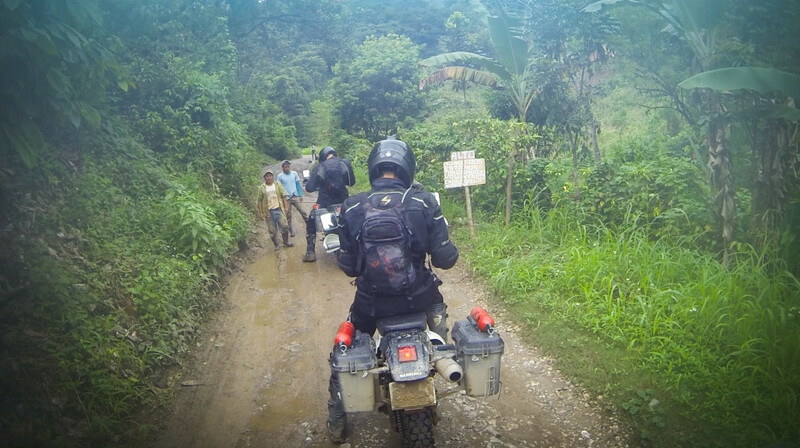 We loaded all the gear up and set off the tackle the Lanquin road and back to civilization. The rain didn’t go that direction so it was dry and we made it up just fine. 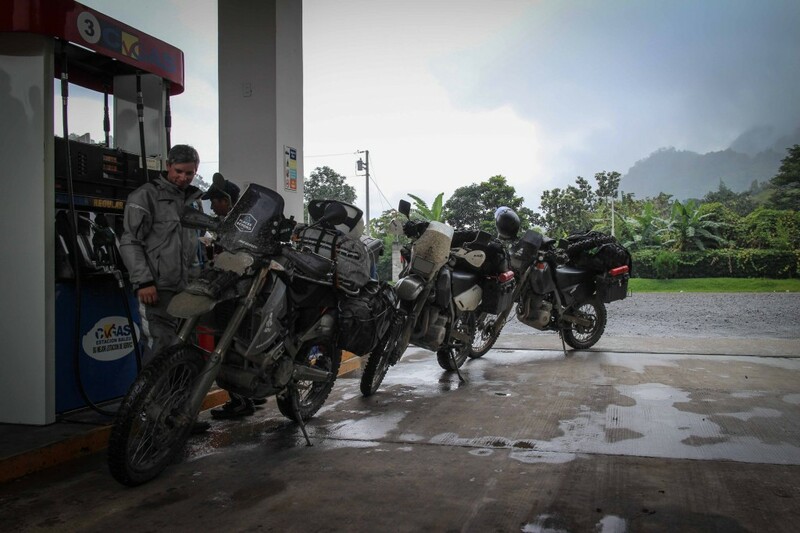 We road to Coban and hit the rain on the highway. We kept going till we found a hotel near the center. For 80Q each ($10) we had 3 bed room with hot water, tv, and blazing fast internet. 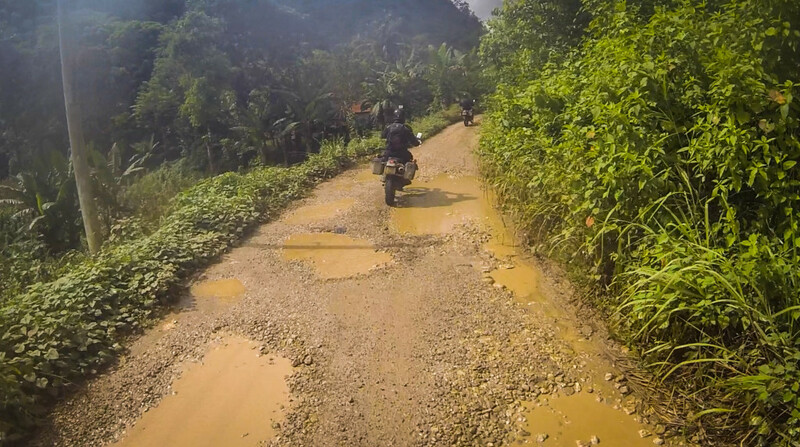 I checked my bike to see what the rough roads had done. The whole back end took a beating. Two bolts from the rear rack sheared off in the frame and 4 bolts from underneath holding the back end on had come loose. It’s amazing it even stayed on. I swear I put blue loctite on those bolts before I left. Tomorrow I will have to find a shop to tap new threads and replace the bolts with spares I packed and then replace the spares. Tbarstow if you’re reading this you were right about the 6mm bolts shearing. I should have changed them to 8mm before I left. For the feeling of accomplishing that ride, regardless of the sheared bolts, I’m stoked. 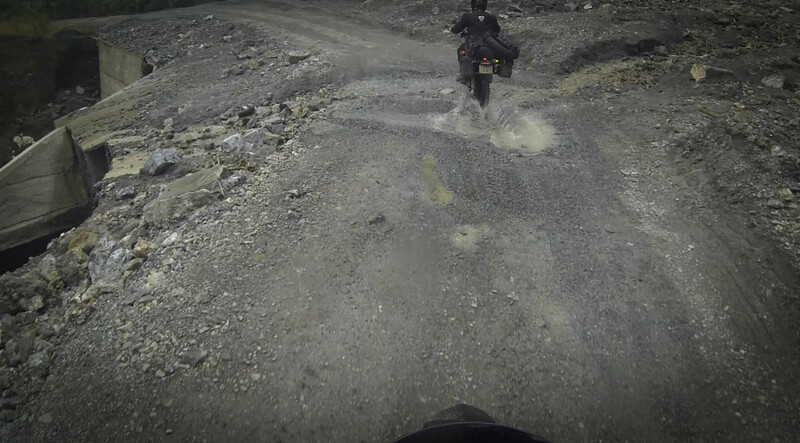 This was basically my second time riding off road like that. The first time was last March at the ADVRider Death Valley Noob Rally. 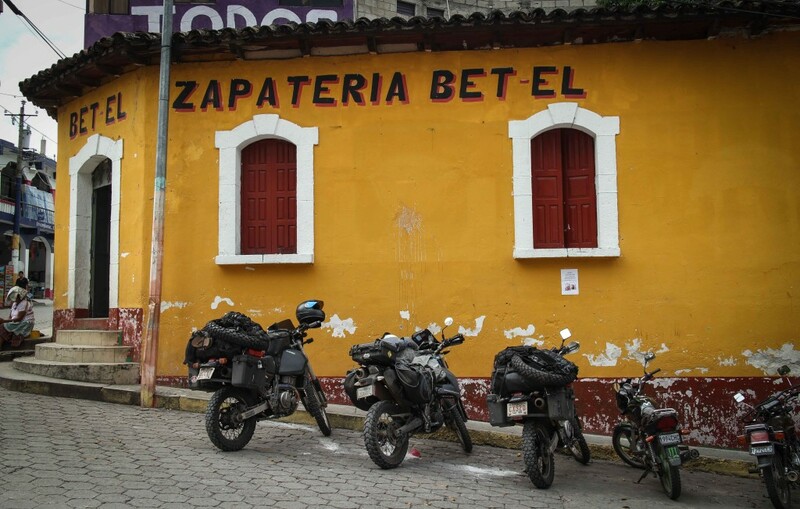 It was that weekend of riding with a great group of ADVRiders (LostRider, MeatPopsicle, NSFW, Nancy, Scubalong and more) that confirmed my desire to do this trip. So even though there were some white knuckle moments, I loved the experience. Reaching the top and giving high fives to Kyle and Trevor was a moment I wish I had on video. I would freeze frame it and play the 80s classic “You’re the best around! Nothing’s ever gonna keep “us” down!” So while it’s nothing major that’s gone wrong, in case the adventure didn’t really start when I left my home in California, I think it’s fair to say it definitely started now. Super exciting post! I felt tired just reading how physically exhausting that adventure sounded! Glad you didn’t get hurt when your bike slipped!